For some, the allure of a real, physical world that you create and control is overwhelming. Combine that with a love of trains, and you get the model railroad. Some are incredibly detailed, and it seems like the larger the layout the better. Not everyone has the real-estate to devote to such a hobby, though, and moving down to N-gauge railroads is often the key to scratching the model railroad itch in a confined space. But [Chris Plumley]’s complete N-gauge model railroad in a coffee table takes the concept to a new and tiny level. The superlatives to describe this layout are many and begin with the coffee table itself, a free-form sculptural design intended to evoke the natural contours of a landscape. Removing the lid reveals an intricately detailed world that rises up on a lift. The mainline train and a two-station trolley line ply the imaginary world under full computer control, complete with sound effects and animated lighting. An LCD screen stands in for a drive-in movie theater — remember drive-ins? — and a house fire rages on, never to be quenched by the arriving fire engines. And as a bonus, the locomotive has a dash cam to provide an engineer’s eye view of the layout. The attention to detail is wonderful, but the kicker is that this layout has existed in one form or another for sixty years. Talk about persistence! If you’re intrigued by combining the world of microcontrollers and model railroads, you should really check out this tutorial to get started. Totally and completely awesome. The house fire is beautifully done, and sick and wrong on so many levels. :) Now I have a hankering for a tiny train setup. I’ve honestly never had any interest in model railways, but this is fricking amazing. Such attention to detail. That FPV from the driver’s cab was a really nice touch too. One of my gripes about coffee-table railroads is how the table surrounds the railroad, and forces you to view it from above. The lift mechanism here is an effective solution to that problem. Nice work. Good for a small space, but if you want to see real attention to real detail then the Pendon Museum near Oxford UK is well worth a visit. I first saw pictures of it in the late 60s, and wanted to visit it then. When my daughter visited, she was inspired to do some modelling of her own. Started the video playing and groan about how long it was. Then when I got to the end wanted more! Beautiful build. 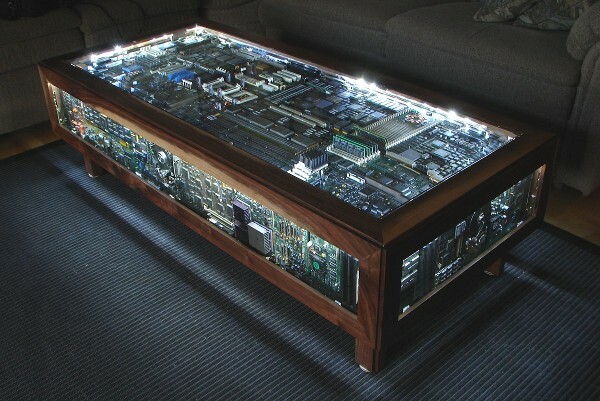 Computer parts coffee table looks good too. 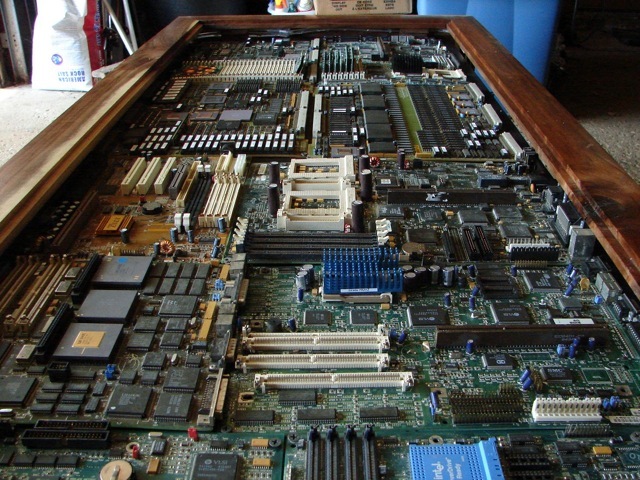 Hi What are the dimensions of the table please. Nothing short of incredible and inspiring. The attention to detail is astounding. As I was taking it all in, I was thinking a FPV camera inside the train would be a nice touch – and of course he’s already done that. Graffiti and scene in the tunnel where the only way to see it is with the FPV cam shows insane attention to detail. That’s amazing.